I wanted to share with you a recent purchase of mine. First let me give a big shout out to my husband who made this purchase possible. Love you honey. 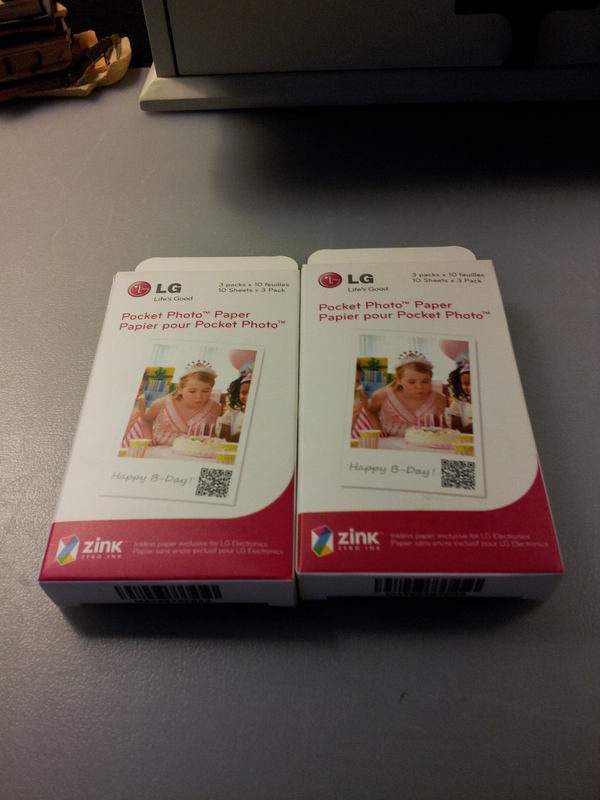 Ok so I’ve had an LG Pocket Photo Printer on my Amazon wishlist for about eight months. When I put it on my list it was $200. It came down $40 recently, which is good, because it is now comparable to what Future Shop and Best Buy have it listed for. Mine was purchased on the July long weekend from Best Buy during a fantastic sale. I was thrilled to finally have it. 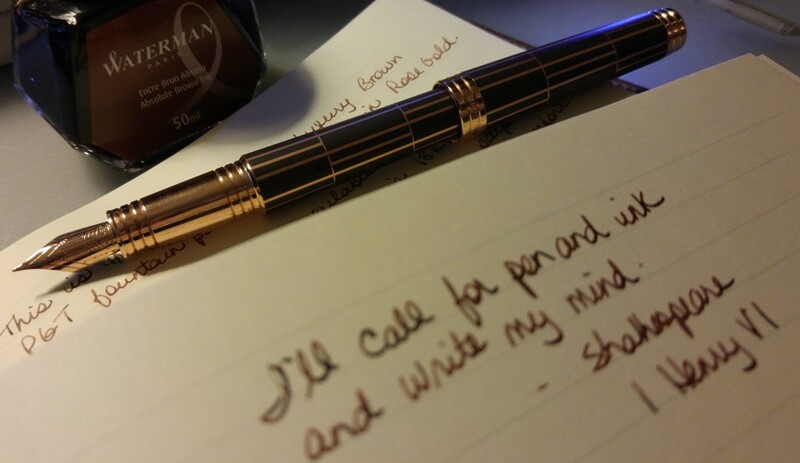 I’ve seen it used quite a bit on Youtube by journallers who want to add small photos to their journal pages. At the time I was actually considering the Fuji Instaxx camera but was encouraged by the Best Buy associate and my husband to go with the Pocket Photo printer. The advantages over the Instaxx are many. In a nutshell the Pocket Photo printer syncs with your phone, using NFC or Bluetooth technology, and prints your photos on 2″ x 3″ paper. The printer does not have any ink cartridges; as I understand it the ink is contained within the special paper used in the printer. 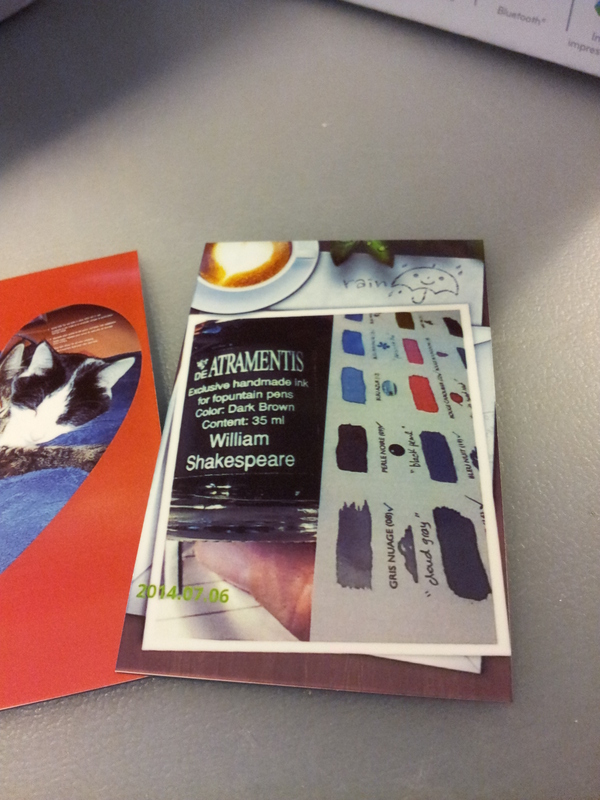 The colours in the photo dictate how far the laser will cut the paper. It’s brilliant and it’s my new favorite toy. You must download an application called LG Pocket Photo (which I accessed through the Google Playstore since I have an Android device; the printer is compatible with iPhone as well) and it is through this interface that you can print your photos. You can choose from a variety of effects and backgrounds to enhance your photo. And the refills for the paper are not too expensive, in my opinion; I bought two packs of refills today for $16.99 each at Future Shop. Each pack holds three packages of 10 sheets of photo paper. So for $35 I bought 60 sheets. That’s about 60 cents a picture. I think that’s well worth the price for the convenience. And on ebay you can find comparable deals on the paper and the devices themselves. Actually ebay is proving to be a popular choice with some of the folks I follow on Youtube; ebay offers the devices direct from South Korea and they come in pink and yellow, sometimes with cases, for just over $200. The problem is, in my opinion, the South Korean devices come with chargers that do not fit the North American electrical outlets. So you are forced to charge the device with the USB cable. Which is no big deal for some but I preferred to buy a North American one. However the only colour available in North America, at least as far as I can tell, is white. And that is just fine with me. What’s in the box: the printer, a package of 10 sheets of photo paper, a usb cable, instructions and a charger. When you first open it you must charge it; mine didn’t take too long, maybe an hour. Loading the paper is fairly straightforward. The instructions are very clear and you can be printing in about 15 mins once the device is charged. There is also a great troubleshooting guide, which tells you what to do if the paper jams (mine did and it was super easy to fix) or if you have trouble syncing your phone. The refill packs. 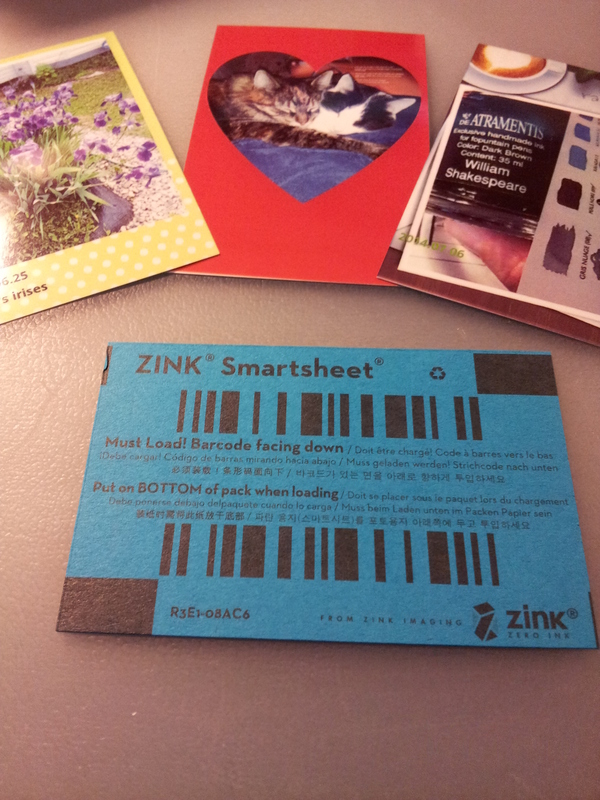 Each package comes with a blue “Smartsheet” which must be placed barcode side down and should be the first page that is printed each time. It’s like a printer test page; it calibrates the device. I’ve also seen refills that are sticker sheets. Here’s the Smartsheet and you can see some of the pictures I’ve printed. 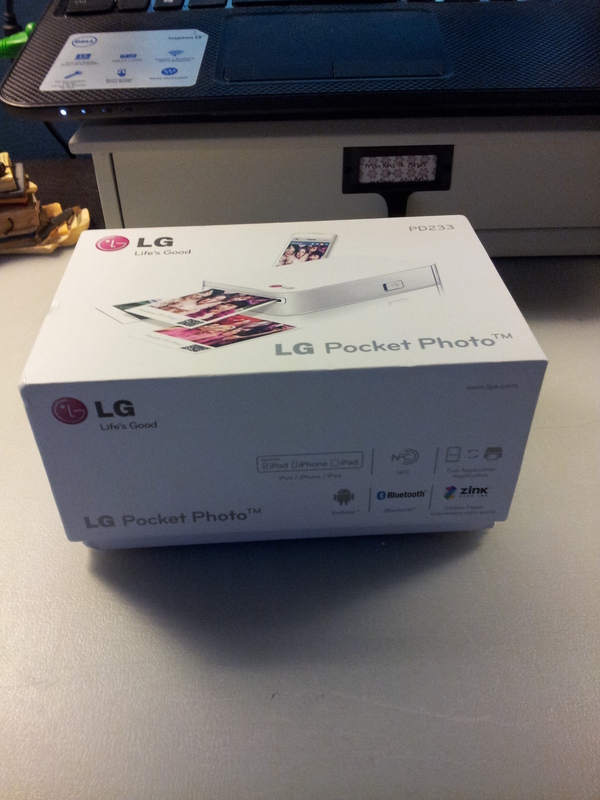 This is one of the “skins” that the LG Pocket Photo application offers. You can add the date and a caption, as I did; and I chose the border of polka dots on a yellow background. 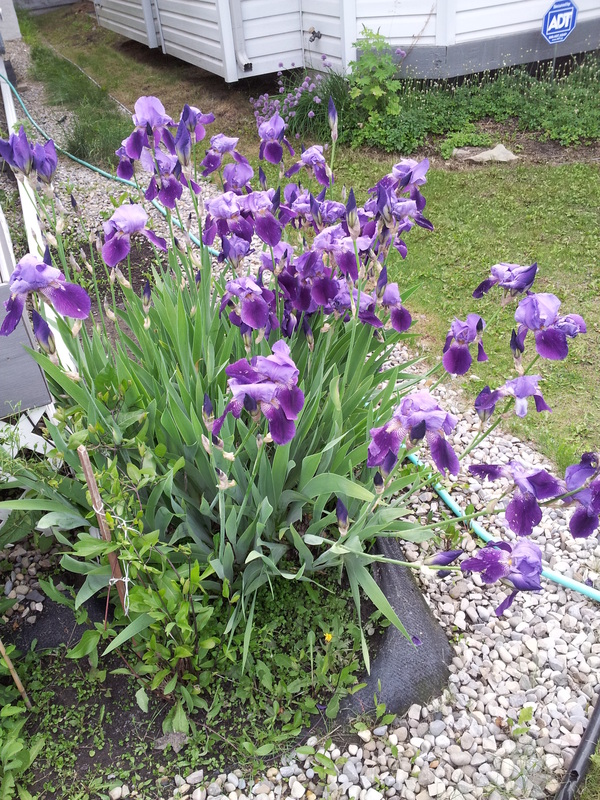 These irises grew in my mother’s garden in Nova Scotia; when my Dad moved out here in 2004 he brought some of them with him. They have thrived and it’s nice to have that connection to her. For comparison of colour, below is the original photo from my phone. Obviously the larger picture is clearer but the colours are pretty close. I’m really pleased with the prints. Here’s another example of a skin that can be used when editing the photo. I thought the heart was appropriate for Halley hugging her sister Gracie! 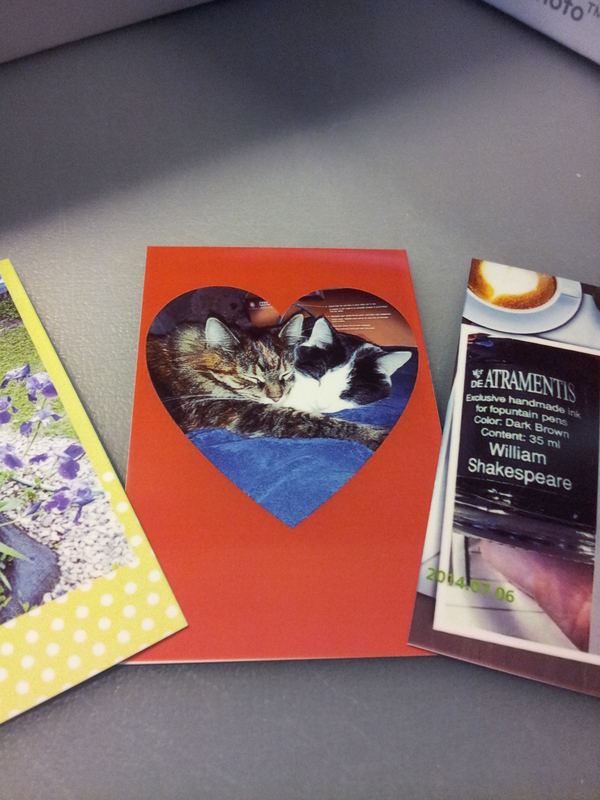 And this is another example of a skin, where I actually split the screen so I could print two photos, side by side. And then I chose a coffee (or tea!) and rain skin to fit them into. Again I included the date, and as you can see you can change the colour of the font, which is nice. You can also change the size from small to medium to large. I don’t think you can change the font itself or apply italics, which would be nice, but hey you can’t have everything. 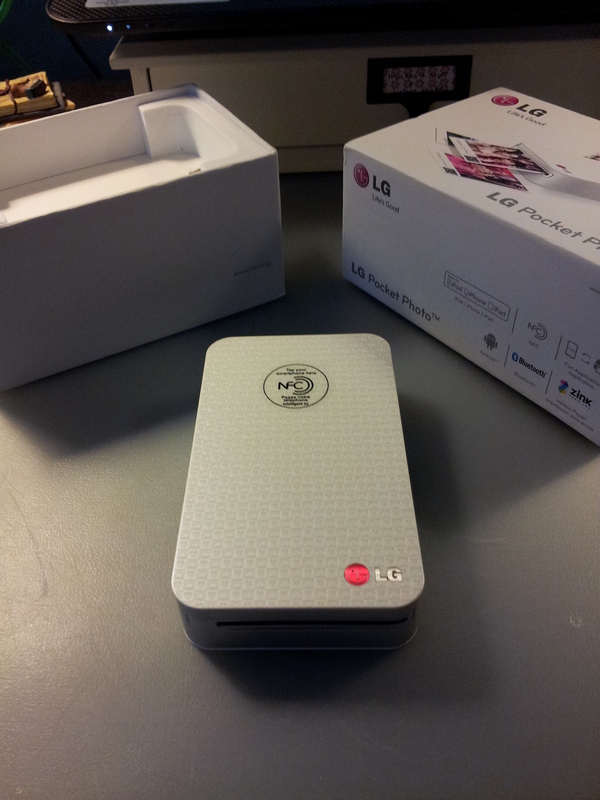 So that’s it for the LG Pocket Photo printer. 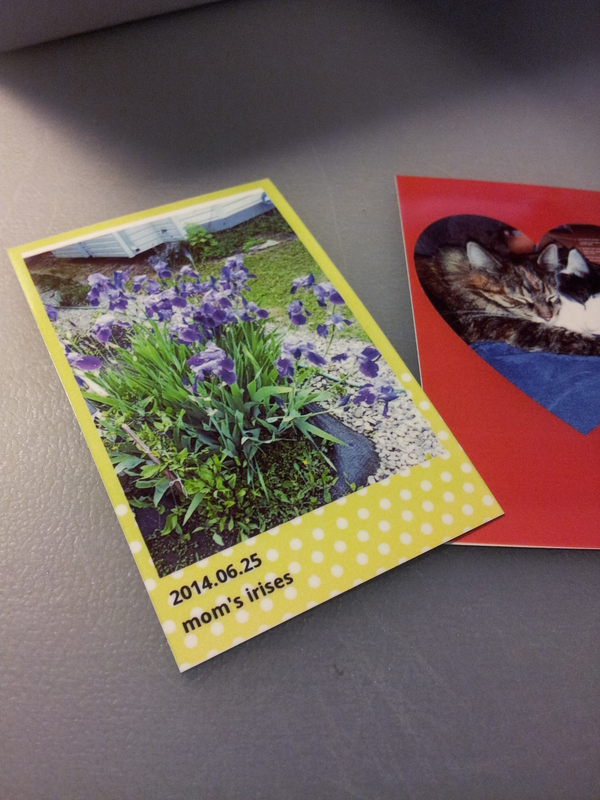 I highly recommend it for printing photos from your phone. The layout options and skins are alot of fun. And of course you can play with the brightness, contrast and saturation to suit your tastes. You can also apply different filters like black and white, sepia, vintage, etc. which I forgot to use for this review. I hope this was helpful and happy printing to go with happy writing! Thanks for the review! I’ve been looking for a printer so I can print photos quickly and without having to wait for them to be delivered by a photo printing service. This one looks pretty good, it’s definitely going on my list! This is a great new discovery as i have been in search for a photo printer as small as this! I have one question though, will the photo fade like polaroid shots? Hi JJ I think the answer to your question is yes. I believe I saw a Youtube video where someone mentioned that. Definitely a drawback. I should have mentioned it in my post. Thanks for pointing that out! Congratulations. What a great little printer and how fantastic that you can print straight from your phone. Enjoy.